Although it has suffered from a bad rap in recent years, this little farming community just up the road from Lewiston-Auburn is quickening with more than just springtime. By Andrew Vietze. Over the last twenty-one years this distinguished environmental leader has fought to preserve what makes the state unique. By Jeff Clark. Can you identify this lovely stretch of sand? Would you make a pilgrimage here, come summer? Forty years ago this month, the nation was aghast when a mouthy young boxer decked the former world heavyweight champ in Lewiston, Maine. Fight fans are still arguing about how he did it. By Rob Sneddon. Ever wonder what those lovely patches of blue are that brighten your neighbor’s dooryard each spring? By Rebecca Sawyer-Fay. To feather their empty nest, a Camden couple has recently reoriented the house they built fifteen years ago. By Edgar Allen Beem. Richard Russo’s Pulitzer-winning novel, set in a central Maine mill town, is coming to HBO’s small screen this month with a star-studded cast that includes Paul Newman. Here are a few numbers the producers won’t tell you. Although nobody wants to go eyeball-to-eyeball with a Maine skunk, Dave Sparks of Windham does just that nearly every day in May. By Ken Textor. I swallowed hard when my friend suggested we check into a sporting camp to do some fly-fishing, but the experience turned into an eye-opener. By Elizabeth Peavey, with illustrations by Marguerite Robichaux. 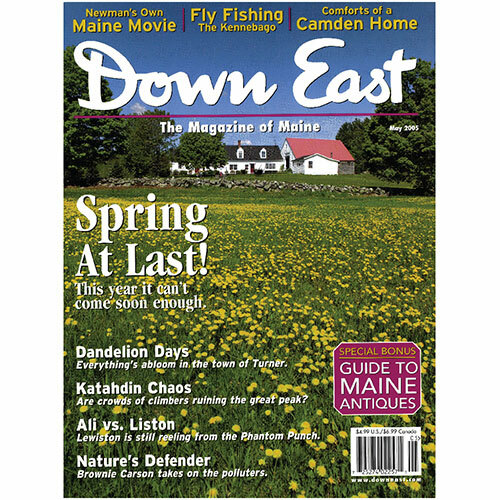 In a special section for antique collectors, the editors of Down East profile the family behind Maine Antique Digest; examine the red-hot market for antique toys; and preview some of the top shows and auctions coming up this year. Opinions and advisories on the chances of a monster wave hitting the Maine coast, a new sales tax proposal that made farmers see red, a marine researcher’s ingenious use of navel oranges, and more. More people every year think climbing the great mountain is mere amusement rather than a serious challenge. By Jeff Clark. Statistics on youngsters in the Pine Tree State are both heartening and disturbing, as an editorial from the Lewiston Sun-Journal explains. 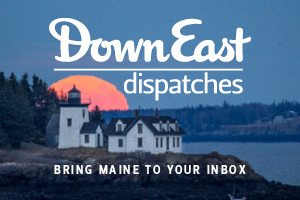 Plus opinions on a Maine Medicaid snafu that is increasing red tape — and costs — for doctors and patients, a new task force in Portland that could reopen the waterfront to new condos, and the sleight of hand of smoke-and-mirror tax reform. May is the month when Down East gardeners seek out Surry. Plus changes in the reservation system at Baxter State Park, a well-known lobster restaurant in cape Porpoise that serves excellent clams, a school for crafting fine furniture in Rockport that is making more than just wood turn, and a Monhegan invasion which has nothing to do with the tourists. By Andrew Vietze. Dining Down East: You Want Fries With That? Two restaurants recently opened by top Portland chefs are redefining street food in the Forest City. By Andy King. A South Portland science writer investigates mysteries in the grass. By Elizabeth Hand. Springtime in Maine means performances, pictures, and plant sales. A river driver’s smile in a classic 1950s photo says more about the genuine feeling Mainers have for spring than any apparent staging. By Joshua E Moore. My landlady in Fairfield quite unexpectedly opened my eyes to certain Maine truths. By Debra Spark.